Guest Speaker: Clifford Stokes, Jr. The Young Professionals of ISACA Tallahassee Chapter events are open to anyone 18 - 35 years old in the tech industry, those of all ages new to the tech industry, and those who have a desire to break into the tech industry. Clifford Stokes, Jr. is currently the Chief Information Security Officer for Florida A&M University. He has over 20 years of industry expertise with a depth of experience and strong performance results in a variety of business leadership/management and information security management roles. With strong analytical skills and the ability to clearly structure complex situations, he develops and delivers solutions. A large part of his security experience is comprised of working in law enforcement performing high tech and cybercrime investigations, as well as, several years managing information security programs, in state government data centers. 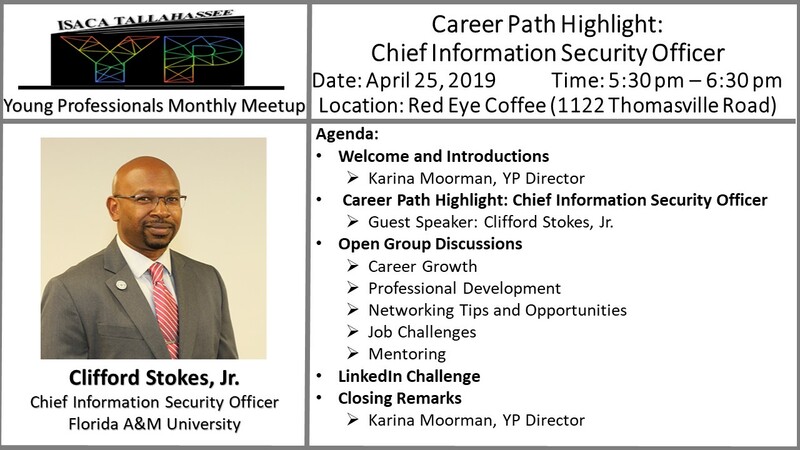 Mr. Stokes’ strengths are developing, assessing, communicating, and managing information security programs with components to include: strategic planning; tactical prioritization; policy development; implementation and management. Mr. Stokes also has experience in the following areas: Auditing, Independent Verification and Validation, Emergency Management, Disaster Recovery, Business Continuity, Intelligence Analysis and presentations.